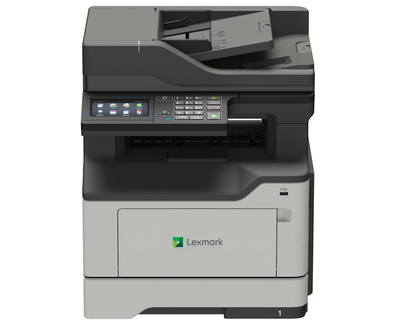 The Lexmark MX421ade prints at up to 42 ppm* and offers fax, two-sided scanning, and copy functions, plus a convenient 4.3-inch touch screen. Robust and reliable, Lexmark multifunction products are built to work anywhere from showroom to warehouse with few interventions. Keep going with long-life components and replacement cartridge yields up to 20,000 pages**. Make every watt count with energy management features that reduce power consumption whether active or in sleep mode. Lower fusing temperature and automatic management of processor cores based on workload help meet rigorous ENERGY STAR 2.0 requirements. That benefits the planet and your budget. A 1 GHz dual-core processor with 1 GB of standard memory gives you the power to do a combination of faxing, printing, copying, and scanning for maximum productivity. And you can be confident that your complex file with images, charts and small print will look just the way you designed it. The MX421ade features the fastest output in its series for exceptional performance, two-sided scanning and a 4.3-inch touch screen offering a wide selection of standard solutions to enhance ease of use, customization and efficiency. * Print and copy speeds measured in accordance with ISO/IEC 24734 and ISO/IEC 24735 respectively (ESAT). For more information, see: www.lexmark.com/ISOspeeds. ** Average standard page yield value declared in accordance with ISO/IEC 19752. *** Award based on North America and/or Western Europe data ****Actual Yield may vary based on other factors such as device speed, paper size and feed orientation, toner coverage, tray source, percentage of black-only printing and average print job complexity.